The chief petitioners were Dennis Farnham, on behalf of the Canyon Country Chamber of Commerce; and Terry Martin, on behalf of the Santa Clarita Valley Chamber of Commerce. The signers of the first petition were (in order): 1. Farnham; 2. Martin; 3. James A . Schutte; 4. Connie Worden; 5. Harry G. (Gil) Callowhill; 6. Michael Djordjevich; 7. Donald E. Hale; 8; Jeannette Sharar; and 9. Louis A. Garasi. 1. That the area known as the communities of Newhall, Saugus, Canyon Country, Castaic, Valencia (as shown on map on page 1) be incorporated as a general law city of certain inhabited territory pursuant to the Cortese/Knox Local Government Reorganization Act of 1985 (Title 5, Division 3, commencing with Section 56000, of the Government code). 2. The name of the proposed city is Santa Clarita. 4. All city officials except the City Council Members shall be appointed. To place upon the residents of the area described herein the responsibility of self-government and the subsequent provision of municipal services as defined and provided for by the Constitution of the State of California. 6. 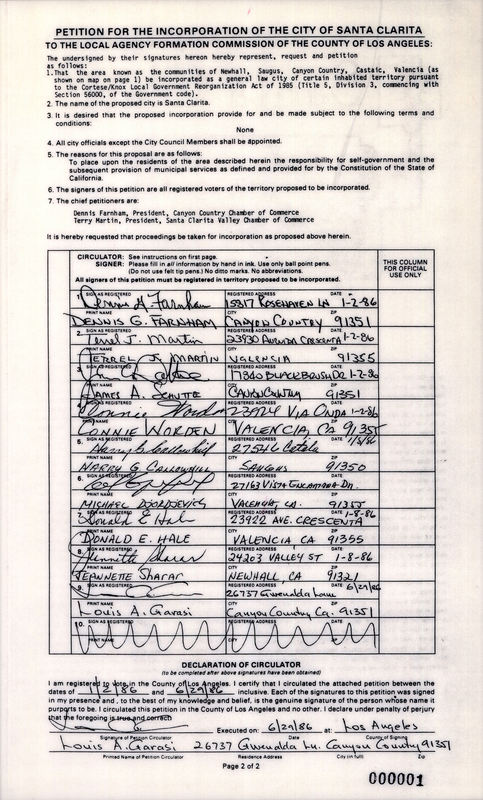 The signers of this petition are all registered voters of the territory proposed to be incorporated. It is hereby requested that proceedings be taken for incorporation as proposed above herein. I am registered to vote in the County of Los Angeles. I certify that I circulated the attached petition between the dates of 1/2/86 and 6/29/86 inclusive. Each of the signatures to this petition was signed in my presence and, to the best of my knowledge and belief, is the genuine signature of the person whose name it purports to be. I circulated this petition in the County of Los Angeles and no other. I declare under penalty of perjury that the foregoing is true and correct. LW2612: 19200 dpi jpeg from photocopy of petition | Collection of Connie Worden-Roberts.